WILLIAMSPORT, Pa. – Lycoming College seniors Ryan Umpleby (Forest Hill, Md./Fallston) and Tyler Kapinus (Eynon, Pa./Valley View) have earned membership in the 2016 Hampshire Honor Society, the National Football Foundation in Dallas, Texas, announced on Wednesday, April 27. In order to be eligible for membership into the honor society, a player must be a starter or significant reserve on the team as a senior, maintain a 3.2 cumulative grade point average throughout his entire course of undergraduate study and meet all NCAA-mandated progress toward degree requirements and graduation. Umpleby enjoyed a fine senior season, picking up his second First Team All-MAC receiving honors after finishing second in the MAC with 980 receiving yards and seven receiving touchdowns. The team's top deep threat, he caught 55 passes for a league-best 17.8 yards per reception for receivers with more than 20 receptions. He finished his career by becoming the first receiver in program history to post more than 200 receiving yards in back-to-back games, notching 207 in a 43-42 win over 19th-ranked Delaware Valley before posting a school-record 241 in his final game against Misericordia. Umpleby led the MAC with 1,736 all-purpose yards, the second-most in school history. A business administration major, Umpleby earned three MAC Academic Honor Roll and three Academic All-MAC nods in his career. 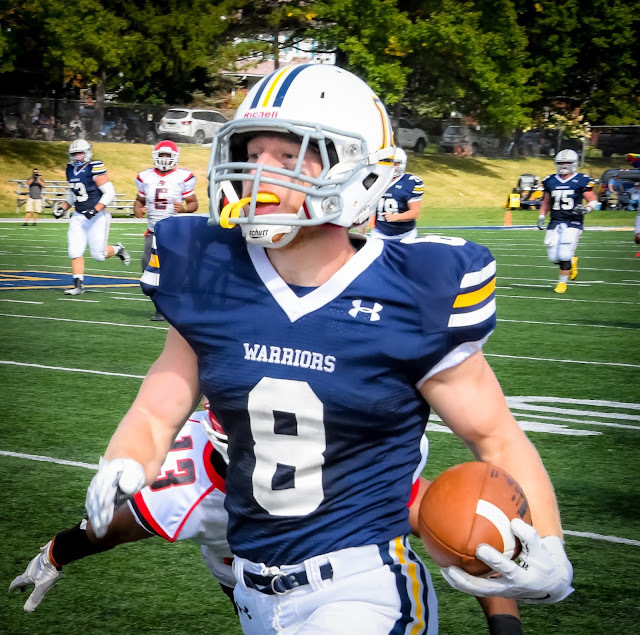 A three-year letterwinner at fullback for the Warriors, Kapinus transitioned to the sidelines for his senior year, as he completed a degree in business management. Kapinus developed into one of the Warriors' top options at fullback in his first three years with the program before an injury caused him to move to the sideline as a senior. As a junior, he made three starts and played in nine games, after playing in six games as a sophomore and serving as a member of the junior varsity squad as a freshman. He was a two-time member of the MAC Academic Honor Roll.